What Is The Bancroft Library? The Bancroft Library is the primary special collections library at the University of California, Berkeley. One of the largest and most heavily used libraries of manuscripts, rare books, and unique materials in the United States, Bancroft supports major research and instructional activities and plays a leading role in the development of the University's research collections. We are located on the east side of Doe Library, just northwest of the Campanile. Western Americana, Bancroft’s largest resource, documents the history of human activity in North America—primarily west of the Rocky Mountains—from the earliest days to the present time, with greatest emphasis on California. Latin Americana is one of the world’s great repositories for historical and contemporary materials on Mexico and Central America, with a particular focus on Colonial Mexico and the Northern Territories. The Pictorial Collection of paintings, drawings, photographs, and other documentary depictions from the earliest recorded images to the present day complements the Library's printed and manuscript collections on California, the far western United States, Mexico, and Central America. The Rare Books and Literary Manuscripts preserves about 400 incunabula; rare European, English, U.S., and South American imprints; fine printing of all periods and places, with emphasis on modern English and American typography; collections of certain major English, American, and European authors; modern poetry archives; and the publications of African American authors. The Collection also includes fine binding and medieval manuscripts. History of Science and Technology holds manuscripts and rare books emphasizing 20th-century American science and science-based technology as well as the physical sciences before 1800. It also contains oral history interviews. University Archives document the history of the University of California, particularly the Office of the President and the Berkeley campus. Collections include administrative records, student publications, Berkeley faculty papers, correspondence, digital files, maps, memorabilia, ephemera, audiovisual materials, oral histories, and photographs indexed in a separate card catalog. The Bancroft is also home to a number of research programs, each supported by an outstanding collection of primary source materials. The faculty and staff of each research program contribute to the teaching and research mission of the university, through undergraduate and graduate courses, group and individual research projects, affiliations with Berkeley academic departments, and relationships with external universities and scholarly organizations. The research programs also produce a variety of print, multimedia, and digital publications of scholarly and general interest. The Center for the Tebtunis Papyri holds more than 26,000 papyri, written in Greek and Demotic scripts, as well as some small artifacts. The collection is the product of a single excavation of a Graeco-Roman town in Fayum Egypt—Tebtunis—funded by Phoebe Apperson Hearst in 1899-1900. The Mark Twain Papers & Project houses the single largest collection of original documents by and about the author: notebooks, correspondence, autobiographical and other manuscripts, lifetime editions, and related materials. Through the University of California Press, the Project is publishing a 70-volume edition of everything Mark Twain wrote. The Oral History Center preserves the recollections of persons who have contributed to the development of California, the West, and the world. These oral histories include series on politics, agriculture, water resources, winemaking, fine printing, land use, and University of California history. Where Is The Bancroft Library? We are located on the east side of Doe Library, just northwest of the Campanile. First housed in the attic of California Hall, The Bancroft Library moved into its present quarters in 1950. At the same time, the original scope of the library was enlarged to include a number of other "special collections," including the former Rare Books Collection. The Bancroft Library now includes the Mark Twain Papers and Project, the Oral History Center, the University of California Archives, the History of Science and Technology Program, and the Pictorial Collection. Since Bancroft is a reference library, its collections are non-circulating. They are available for your use in the Heller Reading Room. Please see our hours and the “Plan a Visit” section for more detailed information about using The Bancroft Library. The Mark Twain Papers and the Center for the Tebtunis Papyri, which are also reference collections, have their own reading rooms in which researchers may work by appointment. Find out more about using these collections. How can I learn more about Bancroft Library collections? OskiCat, the online catalog of the UC Berkeley Libraries, is the first place to search for Bancroft Library materials. For archival collections, look for our finding aids on the Online Archive of California. 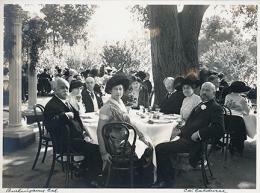 For images from the Pictorial Collection consult the Online Archive of California and the Calisphere. For more detailed information on how to search for Bancroft materials, please visit the How to Find pages.